Sem began playing folk in the 1960's and ran the North London Poly club for 3 years. After moving to Wantage, a chance meeting with Richard Browning at a parent/teacher association event, where Sem was demonstrating his musical talents, prompted Richard to ask him if he had ever considered playing for the Morris. Unsure whether he had anything useful to contribute, Sem submitted a demonstration tape for scrutiny by the late Joe Marns. Thus began his long involvement with The Side. 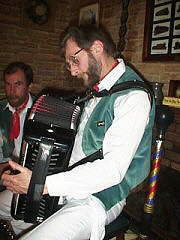 Sem is an accomplished musician, playing accordion, Anglo concertina and mandolin, to name but a few. He is currently the Sides' lead musician and historian, but has also held the posts of Squire and Foreman.